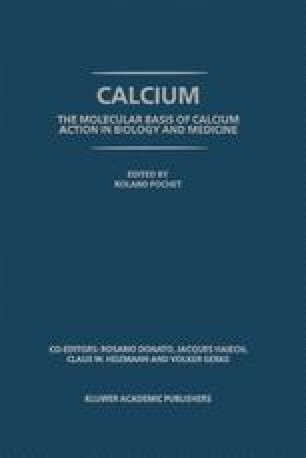 Variations in the intracellular calcium concentration [Ca2+] i play an important role in a variety of intracellular processes, including secretion, contraction and cell proliferation (Berridge, 1993). Increases in [Ca2+] i can be exerted by an influx of ions from the extracellular medium and/or by a release of Ca2+ from intracellular stores. Two classes of intracellular channels that play a key role in regulating Ca2+ release from intracellular stores have been so far identified: the inositol 1,4,5-trisphosphate (InsP3) receptors and the Ryanodine Receptors (RyRs) (Berridge, 1993; Sorrentino and Volpe, 1993). InsP3 receptors are described in Parys et al. (this book). This chapter will focus on the second class of intracellular Ca2+ release channels: the Ryanodine Receptors.